For those who are into index investing will know how frustrating it is to do so. Vanguard has decided only to make its index funds available to Accredited Investors. Those who prefer to invest in MAS approved funds could only invest in Infinity Global Stock Index which feeds into the Vanguard funds. Due to the feeder structure, the cost of Infinity Global Stock index is not low. The adventurous have no choice but to invest in foreign listed ETFs. However, foreign ETFs are not without problems such as estate duty, withholding taxes, lack of easy access to regulatory protection and high trading cost for small amount. Moreover, it is not possible to do Regular Saving Plan (RSP) for ETFs. The good news is that there is a new alternative: Dimensional Funds. Dimensional Funds are now available for retail investors. Previously it was only available for Accredited Investors. Dimensional Funds are passive funds. The fund manager does not attempt to time the market or try to forecast the impact of a US-China trade war. 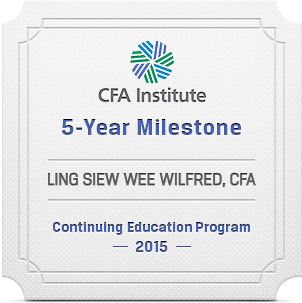 However, their approach to passive investment is different from traditional passive funds. Dimensional Funds overweight stocks with lower relative price, smaller market capitalisations, and higher profitability (using an adjusted measure of operating income). This is based on research from Eugene Fama and Kenneth French that shows that stocks with these characteristics have tended to outperform over the long term. Unlike a traditional index fund that rebalances when the index is rebalanced, Dimensional Funds make buy and sell decisions based on current prices. For example, if the price of a security in a value fund has move out of its ‘value range’, the Dimensional Fund will make a sell decision. A traditional index fund, on the other hand, will not sell until the index rebalance and this is typically once a year. Traditional index funds tend to be subject to front-running. Front-running occurs when many investors buy or sell securities knowing that the index is to be rebalanced. Traditional index funds end up buying securities that have already moved up and selling those that are already moved down. 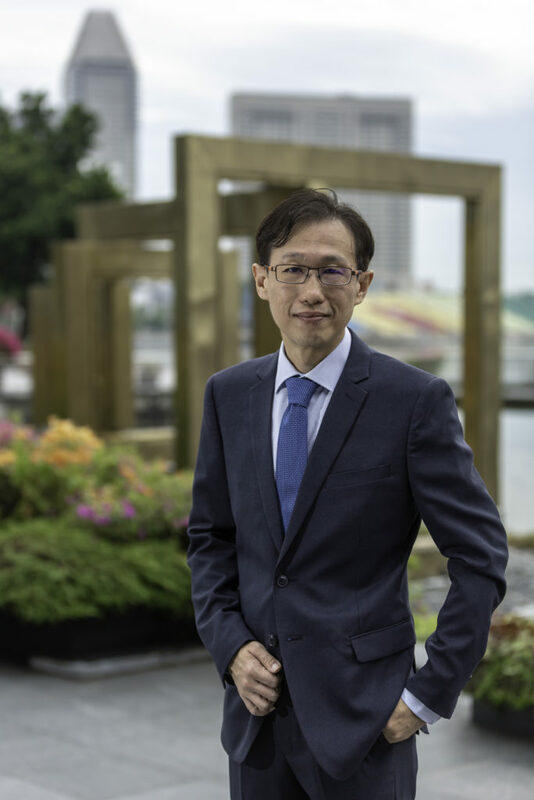 Dimensional Funds avoids front-running problem by spreading its trading all year round. The fund also make cost/benefit tradeoff analysis before it trade. This means it will not trade if the cost of trade exceeds that of the benefit. Dimensional Funds are structured as collective investment scheme. The minimum investment amount is $1000 and minimum regular saving plan is only $100. Also, the sales charge is 0%. There are quite a number of Dimensional Funds available now but I prefer to keep things simple by just focusing on Dimensional Global Core Equity and Dimensional Emerging Markets Large Cap Core Equity as buying these two funds would cover all equity markets in the world. 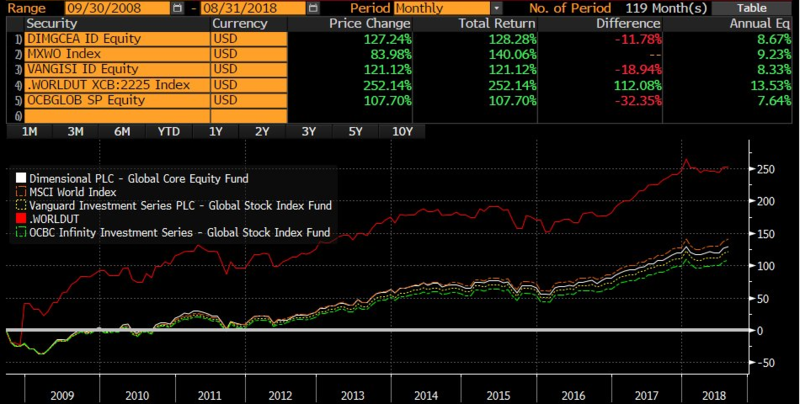 It can be seen above that Vanguard Global Index (institutional share class) is still the cheapest and the most expensive is Infinity Global Stock Index. 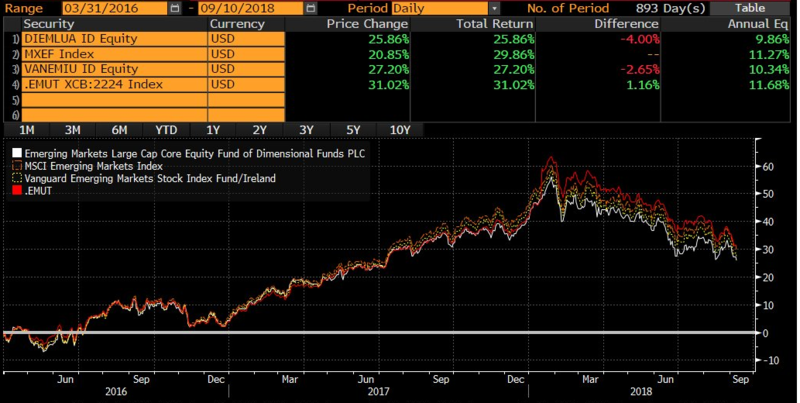 The above performance chart shows that the Dimensional Global Core Equity (8.67%pa) outperformed the Infinity Global Stock Index (7.64%) by a wide margin. This is to be expected since the cost added by LionGlobal increases cost without any corresponding benefit in returns. The Dimensional Global Core Equity (8.67%pa) also did better than the Vanguard Global Stock Index (8.33% pa). The “.WORLDUT” ticker refers to the average global equity funds in Singapore and surprisingly did superduper well (13.53%pa)! Why is this so? It can be seen above that Vanguard Global Emerging Market Index (institutional share class) is still the cheapest. The chart above shows that Vanguard Global Emerging Market (10.34%pa) outperformed the Dimensional Emerging Markets Large Cap Core (9.86%pa). However, for an investor with no access to the Vanguard funds, Dimensional Emerging Markets Large Cap Core Equity provides reasonably good returns relative to the index. The “.EMUT Index” ticker refers to the average performance of emerging market funds in Singapore which did better than two passive funds and the index! Why is this so? I have always tried to avoid doing product review in this blog because I do not wish to be seen to be endorsing any particular product providers nor to be misunderstood to be making any form of product recommendations. Hence, this article is for information only and if you wish to make any form of investment decision, please make an appointment to meet me for a proper consultation. For those who are keen to know why the average active managed funds did better than its index, well, that will be another blog for another day. Make sure you are on my mailing list by signing up below so that you will not miss the article when I publish it.